In the meat processing industry, water is used extensively for washing the cattle, sheep or pig carcasses. Water is also used for sanitizing and thoroughly cleaning of all equipment used in the process at the facility. A large quantity of water is also used for scalding of hogs to facilitate hair removal. Federal regulations dictate that a complete cleaning and sanitation process be conducted after every killing and processing shift at the plant. The cleanup period generally uses considerably more water that the actual processing of the meat. As a result of there being often time in between shifts and the processing cleanup phases the generation of wastewater can be inconsistent. Ecologix provides comprehensive wastewater treatment technologies and services for every facet of the meat and poultry industries. From preliminary screening of grit or feathers, to physical/chemical separation and sludge management, we will help bring your facility into compliance with local wastewater discharge permit requirements. Meat processes generate wastewater with similar characteristics. They each contain high levels of TSS, FOG, and BOD. In these types of facilities, cities collect surcharges based on discharge loadings. Sometimes these surcharges can reach tens of thousands of dollars per month. When municipal wastewater treatment facilities are unable to handle fluids from industries, cities can terminate discharge permits, forcing businesses to figure out a solution or shut down their plants. 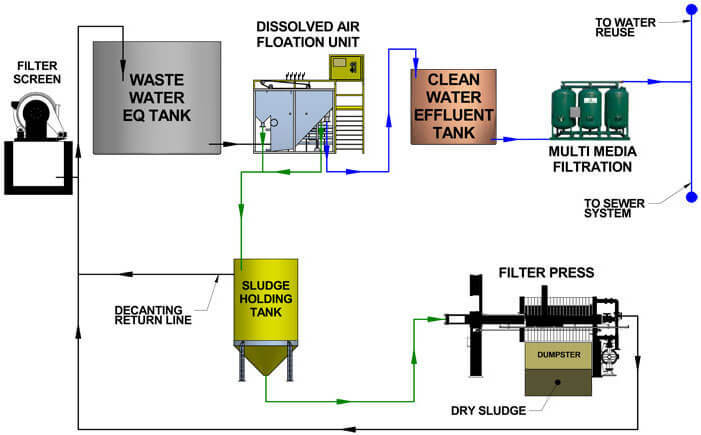 In such cases, a wastewater dissolved air flotation (daf) system is the best option. By applying a chemical/physical separation process, facilities can completely remove TSS, FOG and high concentrations of BOD. When properly designed, a pre-treatment system will help bring effluents into permissible levels for discharge to the city sewer. A pre-treatment program is focused on reducing contaminants that result in surcharges – for dairies and meat processors, that means removing TSS, FOG, and BOD. The video to the left shows a pre-treatment facility based on Dissolved Air Flotation technology. Pre-treatment systems are sized by daily flow and hours of operation. For a facility that produces 60,000 gallons per day of wastewater, they could process their wastewater at roughly 42gpm, 24 hours a day. Sometimes it makes economic sense to process the daily wastewater in half the time – 80gpm for a 60,000GPD flow. Finding the balance between capital and operational expenses is the key. Ecologix Environmental Systems custom configures a full treatment system that can screen and treat the wastewater to discharge levels that meet or often exceed local municipal requirements. 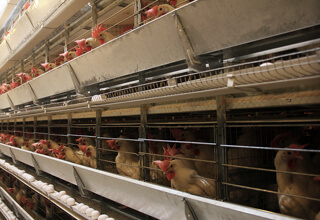 Please review further our current offerings for the poultry industry and contact us today to learn more about solutions we can offer your business. If you have a wastewater issue at your meat processing facility, fill out our wastewater treatment background form or give us a call and we’ll be glad to help out. 678-514-2100.